List of some best match 3 puzzle games similar to Candy crush saga. Jolly Jam is a new puzzle game for Android and iOS. 1. Candy Crush Soda Saga (Android/iOS) is a sequel and good alternative to Candy crush saga, it packs some new gameplay and exciting levels. 2. Best Fiends (Android/iOS) is a adventure puzzle game with a well crafted story based gameplay and features cool characters. 4. Jelly Splash (Android/iOS) Match the colorful jellies and complete 360 different challenging levels. 5. Cookie Jam (Android/iOS) is a sweet game with a bunch of tasty levels to explore and find delicious items. 6. Juice Cubes (Android/iOS) comes from the developers of the Angry birds series and users have to match juicy fruits to finish the levels. 7. Bejeweled Blitz (Android/iOS) is developed by EA and promises to keep you engaged for some time. 8. Treasure of Montezuma 3 (Android/iOS) is a adventure game with awesome power-up's and high quality graphics. 11. Zookeeper Battle is a action style puzzle game where players have to match animals to complete the levels and the game is available for both Android and iOS devices. 12. Battle Gems game is full of monsters and characters that can be customized to play and win against other players in PvP battles. 13. Puzzle & Dragons RPG style puzzle game that has a large user base in Japan and it quietly attracting players from all over the world. 14. Dots is a fascinating puzzle game with a minimal design that impresses many and it too got a sequel with Dots 2 featuring additional game modes. 15. 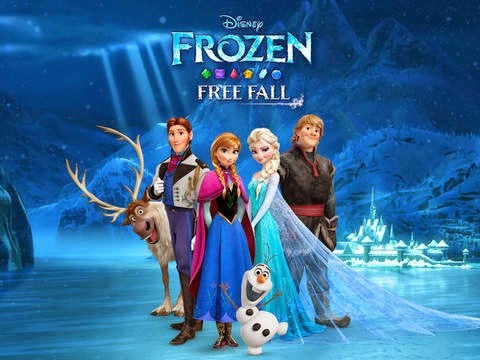 Frozen Free Fall is a game from Disney and is game version the amazing animated movie Frozen free fall. 19. 10000000 The RPG puzzle game is as interesting as it title and is quite an difficult game to get started with. 20. Doodle Find lets you match different doodles and compete with your friends to make high scores.